Rin is safe at Sango's hut helping Kohaku to re-bandage his wounds from earlier. She tells Kohaku and Sango, "Thank you for coming for me, I really didn't know how I was going to get out of that situation." Sango replies, "It's fine Rin, I'm just glad we were able to get to you in time...Zeref is evil and he is as powerful as Sesshomaru." Rin replies, "I hope Lord Sesshomaru is okay, I'm so worried." Sango puts her mind at ease, "Don't worry Rin, I have no doubt that Lord Sesshomaru can take him down." Rin smiles at Sango and remembers, "Oh, Granny Kaede, I told her I would be home by dinner, I'd better let her know I'm safe." She rushes off toward Lady Kaede's hut and runs directly into Sesshomaru and Inuyasha returning from the battle with Zeref, "Lord Sesshomaru!!!" Rin is absolutely relieved to see that he is safe, she runs up and straight into his arms. Sesshomaru embraces her, Rin and Sesshomaru Kiss for a moment....Inuyasha looks on in astonishment and thinks: What? ?, They kissed?? Sesshomaru asks, "Are you okay, did he hurt you Rin?" she responds, "No Milord, I'm okay. I was on my way to see Granny Kaede to let her know I am home and safe." Sesshomaru responds, "Very Well, go to her and I will wait here for you to return." Rin assures him, "I'll be back here shortly Milord. Oh, Inuyasha...Thank you so much for all of your help." Inuyasha tells her, "Ah, Rin you don't have to thank me for that...We won't let anyone hurt you." Rin smiles and heads off. Inuyasha: "So, What is this now?" Inuyasha: "Whad'a ya mean nevermind? What did I Just see? Are you and Rin a couple now?" Sesshomaru: "Why should this suprise you? Rin has blossomed into a beautiful woman." Inuyasha: "Well, Yeah but she's human." Sesshomaru: "Are you only realizing that just now, Inuyasha ?" Inuyasha: "C'mon Sesshomaru....... You know what I'm saying, You used to hate humans?" Sesshomaru: "I have never hated Rin." Inuyasha: "Well, I'd better be getting back to Kagome. " Sesshomaru: "Rin tells me that Kagome is to give birth to your first born soon." Inuyasha: "Yeah, any day now. You will come to see the baby won't you?" Inuyasha: " Look, Don't go giving me some crap about not wanting to be uncle to a one thirds demon child or I'll crack your skull right here and now, Sesshomaru!!! Sesshomaru: "I suppose I should make an appearance though I'm not making any promises. Inuyasha hurries off and Sesshomaru is left waiting for Rin at the lake. After waiting only a few minutes later, Rin appears, walking up... so Sesshomaru extends his hand for her to sit next to him. Rin sits next to Sesshomaru near the lake and he holds her hand in his hands. Sesshomaru informs Rin, "The demon that had you kidnapped is named Zeref. He is on a quest to gain complete power; he wants me and my empire but I will never hand that over to him, I've earned every piece of my empire and there's no way I will let him conquer it. It appears that he wants you as well, I won't let that happen either.... therefore the time has come for you to make your choice Rin. Will you stay here in the village and live life amongst the humans? or Will you come with me, Marry me and live at the empire? I will support which ever option you choose." Rin does not hesitate to answer Sesshomaru's question, "My Lord, I have already made my decision many years ago, nothing has changed. I want to be with you." Sesshomaru is extremely happy with Rin's final decision but he does not show any emotion he simply informs her, "Then I will be at Kaede's hut tomorrow morning for you, I want to take you to the empire...you should see the castle and familiarize yourself with the grounds, also I have something to give to you. " Rin tells Sesshomaru that she will be ready early tomorrow morning, Sesshomaru walks her back safely to Lady Kaede's hut. Rin and Sesshomaru kiss their final kiss for the night and Sesshomaru disappears off. Rin is so excited and happier than she imagined she ever could be but she wonders how is she going to tell Kohaku that she is now engaged to Lord Sesshomaru and that she is going to live her life with him at his castle. Rin ponders this situation about telling Kohaku all night while in bed but she simply cannot bring herself to tell him. Rin thinks to herself: Kohaku and I have become so close, we've kissed and embraced many times...I think he'll be heart broken If I tell him but I have to be the one to tell him...when the time is right, when we are alone. Rin lies in bed with thoughts running through her brain and many emotions in her heart: Love for Sesshomaru, Excitement for her future and regret for what she must do to Kohaku. The next morning Sesshomaru shows up as promised to take Rin to the empire, Jaken is with him. The empire is a distance away so Rin and Jaken fly on Ah Un while Sesshomaru guides the way. When they reach the empire Rin is astonished by what she sees. The castle is so huge Rin is able to see it from a distance in the sky, as she approaches there has to be over a thousand demons some in humanoid form, some in there natural state. Many of the demons are working on the castle or the grounds while others are guarding the castle. The grounds are beautifully cared for and plenty vivid green land. She asks, "Master Jaken, Did these demons create all this for Lord Sesshomaru?" Jaken replies, "absolutely, these demons are dedicated to our master, they built this elegant castle and all this land belongs to Lord Sesshomaru now." Sesshomaru instructs Jaken to show Rin all around the castle while he speaks with his four most Elite Guards that serve directly under him and keep charge of issues while he is away. Rin looks over in the distance further away from the front of the castle and she can see many small huts and it looks like a huge village. Jaken notices she is looking in that direction and tells her, "Oh, Those are just the huts where the demons of the empire reside, Lord Sesshomaru can't have them all roaming around outside his castle all day." Jaken guides Rin to the front of the castle that has two dog demon statues on either sides of the long staircase leading to the front opening. Six humanoid demons guard the front entrance. Jaken continues to show Rin Sesshomaru's Throne and some extra rooms in the castle. 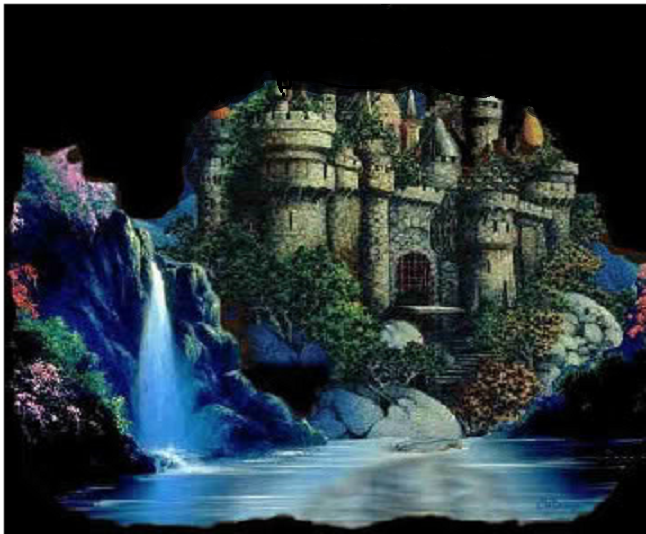 There is another door leading to the back of the castle that is breathtaking, there is a large private lake with a waterfall and a stairwell leading right to the lake, Rin cannot help but comment,"Master Jaken, I've never seen anything so beautiful." Jaken replies, "Yes, I know...come on, I'll show you the sleeping quarters." Jaken takes her up a long stairwell and through a hall. 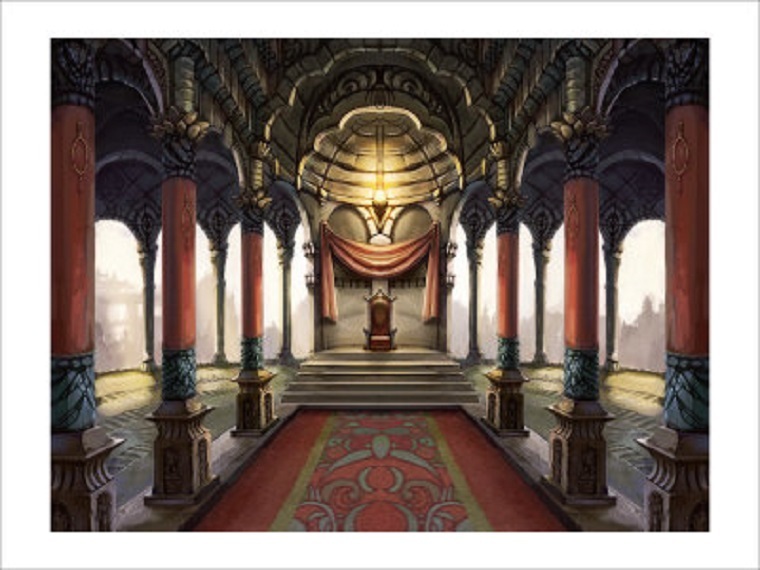 There are quite a few rooms and Jaken shows her where he sleeps, Where the servants of the castle reside and Where Master Sesshomaru will retire at night. Jaken sarcastically adds, "I suppose you'll both retire here." Rin looks at the huge room with a fireplace and a real bed; she is amazed because she has never seen a real bed, Only the rich are in possession of such things. She has always slept in the woods and while living with Lady Kaede, Rin's bed consists of a futon mat and many cotton blankets. "You'll be happy here Rin, No more sleeping in the woods for us. I never lost faith that My Lord would get his empire at such a fast rate. " Rin remembers, "Hmmm, I can recall you telling me that I would be long gone before that time comes." Jaken replies, "Quiet Silly Girl, I would never underestimate My Lord's abilities!" Rin smiles and Rolls her eyes. Sesshomaru's voice caused Rin and Jaken both to look up, "Jaken, See to the servants...I need to speak with Rin." Jaken complies, "Yes Milord. " Rin walks up to Sesshomaru and she compliments the castle, "My Lord it's beautiful, I'm so happy you chose to share all of this with me." Sesshomaru goes to a shelf on his wall of his bedroom and gets out a small diamond and explains to Rin, "I had one of the sea demons that serve under me retrieve this for you. It is a rare diamond that has been buried deep under the Yukoric Sea for hundreds of years. Soon I will have a band attached to it which will fit only your finger and this will be your ring that will validate our marriage." The medium sized diamond illuminates a sea blue color and is the perfect size. Rin feels tears begin to form, she cannot believe how good Lord Sesshomaru has been to her and how much he seems to love her. A tear falls down Rin's cheek as she responds, "Lord Sesshomaru, I'll treasure it always." Sesshomaru wipes the tear from her cheek and kisses her softly. As he continues to kiss her, He begins to untie Rin's Sash that holds her Kimono, he stops and he then asks her, "Rin, do you love me?" Rin answers quickly, "I have always loved you , With all my heart." Sesshomaru returns to kissing her and removes the top layer of her Kimono. Jaken has many duties as Sesshomaru's Chief Minister besides just advising the demon servants. He also checks on all the servants, passes on Lord Sesshomaru's orders and Takes care to sharpen Lord Sesshomaru's weapons, However Jaken has not been able to sharpen the weapons because Lord Sesshomaru and Rin have been in the resting quarters most of the day, Jaken knows not to disturb his Master so he continues on with his other duties. After many hours, towards mid day, Sesshomaru is up and dressed, he is stepping out momentarily to take care of some important matters. He approaches Rin to wake her and inform her that he will return shortly but she is lying there sleeping so peaceful and the form of her bare body under the sheets is so beautiful that he just stares instead and thinks to himself: Since you were little...you have been the very cause of my weaknesses and Vulnerabilities. Why am I not able to resist you when I have tried several times? Were you sent by the Gods?- or by father perhaps to mock my hatred towards humans? Sesshomaru caresses her hair and walks off, Sesshomaru sees Jaken on his way out and instructs him, "Jaken, send a servant up with food for Rin." Jaken complies, "Yes, Certainly Milord." Sesshomaru walks outside the castle, informing his demon servants to guard the quarters and protect the girl inside until his return. Rin spends three weeks with Lord Sesshomaru in the castle. She finds herself becoming relaxed with the servants and she is learning the grounds and area quickly, Although Rin can sense that some of the demons are not happy with a human residing in the castle she feels comfortable around the majority of the demon servants. She is extremely excited to begin her life at the empire however, she and Sesshomaru decide that she will remain at the village for another week or two to say her good byes to everyone. Rin has spent many years with Granny Kaede, Sango, Kohaku, The Panther Demons and many others; she has grown extremely close to all of them. After three weeks at the palace, Rin flies Ah Un back to the village and prepares herself to tell everyone that she will be leaving the village to remain with Lord Sesshomaru at his castle but she finds this task more difficult than she had anticipated, The empire is a far distance from the village, Rin knows she will not be able to visit too often so she feels it's not easy to say good bye. Rin sees Lady Kaede and greets her, telling her all about Lord Sesshomaru's Kingdom but she does not inform her that she will be going to live with him, she holds off on this information until she feels comfortable. Lady Kaede informs Rin, "My child you should seek Kohaku, he has been looking for you every day since you left with Sesshomaru." Rin feeling regretful of this news, "Oh Kohaku, He must be wondering where I've been." Lady Kaede tells Rin, "I informed Kohaku that you left with Sesshomaru but I didn't expect you to be gone for so many days, I did not know when you were planning to return however I knew that if you were with Sesshomaru, you must be safe." Rin informs Lady Kaede that she will return before night fall but she must see Kohaku. Lion demon Zeref is recovering from his wounds that he endured while battling Sesshomaru. He is now not only thinking of ways that he can rule over Sesshomaru's empire of demons but he has not been able to stop thinking of the beautiful human girl that serves Sesshomaru, ...Rin. He tells his trusted advisor and one of his most powerful henchmen, " I know I can eventually get Sesshomaru and his demon servants to fight for me whenever I desire, which in turn will make me the most powerful ruler of the Eastern and Western lands but the human girl, Sesshomaru will not let her go without a fight to the death...that I also know. I can't say I blame him but I want her." His advisor beholds upon Zeref a plan, "Perhaps we can make her come to you willingly My Lord, then Sesshomaru will have no choice but to accept the defeat of losing his woman." Zeref requests more information, "And how do you propose we do that? She is devoted to Sesshomaru." Zeref's adviser continues," I know of a demon creature whom stays secluded in the Eastern mountains, he is a weak useless soul when it comes to battle or gaining power but he is quite useful with the play on human heart and mind. You see this particular demon has the ability to intensify human emotions he can turn hate into love or he can make the feeling of love or hate triple it's normal strength." Zeref is very intrigued, "He turns hate into love you say, how about love into hate?" The adviser informs,"Yes love into hate as well," The adviser dons a sinister smile as he continues speaking, "We can harden the girl's heart against Sesshomaru and soften it in your favor Milord, all the demon would need to do is have a conversation with her. " Zeref orders his adviser to find this demon and bring him to the empire right away. Rin finds Kohaku at his hut and he is extremely happy to see her, "Rin, I've been looking for you for weeks." Rin apologizes for her sudden absence, "I'm sorry about that Kohaku, Lord Sesshomaru and Master Jaken took me to view the empire, It wasn't planned for me to stay so long. " Kohaku could care less about Lord Sesshomaru and never even payed attention to the fact that Rin spent many weeks with Sesshomaru, he is just so happy to see that Rin is back and he is anxious to speak with her; He starts off, "Rin, I've been thinking about something while you have been gone." Kohaku walks up to Rin and holds her hands in his as he continues, "I've missed you like crazy while you were away and when that flying demon kidnapped you and I thought you might be hurt, I realized that this is not the life I want for you." Rin tries to stop him from continuing, "Kohaku, wait I need to tell you something." Kohaku is so nervous to get his speech out that Rin's interruption does not phase him as he continues on. He firmly holds her by the arms, "Marry me Rin, We can have a wonderful life here in the village with all our family and friends right here. I'll earn money demon slaying alone and I'll take care of you, I'll make sure you have everything you need." Rin looks in Kohaku's eyes, he is anticipating her answer, She can not bring herself to hurt his heart by turning down his offer of marriage,In addition to divulging the secret she's been keeping from him. Tears flow down her cheeks as she cries, "Oh Kohaku...Please I need to be on my own for a while." as she pushes herself away from him and runs off. Kohaku yells "Rin wait!!" Kohaku allows Rin to be alone with her thoughts while he confides in his sister Sango for advice. Kohaku tells Sango everything that just happened and asks her what does she make of the situation. Sango seems a bit bewildered by Rin's actions; she can not give Kohaku an answer to his question, she tells Kohaku to give Rin sometime to think about the proposal...Maybe it caught her off guard. As Rin is sitting at the lake, she can't stop the tears from flowing...she feels sadness for Kohaku, She wonders how she is going to tell him that she loves Lord Sesshomaru and that she will be married to him soon. She knows he will feel betrayed, the times they've kissed and were affectionate with each other all while she knew she was in Love with Lord Sesshomaru. Rin feels so much guilt and shame for her dishonesty; as she tries to wipe her tears she hears Sesshomaru's voice behind her, "Rin. Why are you crying?" Rin is surprised to see him here and at this moment of all times, "Oh, Lord Sesshomaru...I wasn't expecting you Milord." She tries to wipe the tears faster and sniffles a bit. Sesshomaru stands close to her and asks her again, "What is it ?" she looks up at him as she answers, "Oh I'm so happy to be going back with you but sad about leaving everyone. I guess it's just my silly human emotions getting the better of me." Sesshomaru responds, "They are not silly emotions Rin, although I am immune to such intense emotion, I do understand how you must feel." Rin continues, "I came to the lake to gather my thoughts." Sesshomaru remembers something, " Rin come with me, I have something I'd like to show you. We'll have to fly." Rin climbs on Sesshomaru's back and wraps her arms around him to hold on tight as they fly up, As they are in the air and she is holding him tight, her heart refills with love and joy...being alone with Lord Sesshomaru, sailing the beautiful blue skies like this changes her entire mood quickly. Sesshomaru takes Rin to a secret area she has never seen before, not even in all her travels with Lord Sesshomaru from the time she was 8 years old. Rin looks around in amazement at this forest that looks simply magical to her, Trees and flowers that illuminate with such vivid colors ; even the air in this forest seemed to be different with its warm soft breeze that seemed to constantly pass them. Rin asks, "Lord Sesshomaru, what is this place? I've never seen a forest like this. It's amazing." Sesshomaru explains, "This is a secluded forest, my father owned this land, he was working on a second kingdom before he perished. It is now sacred land belonging to my father, that was passed on to my mother when he left us. It is a small forest, my mother had no use for it and passed it along to me. I have no use for it either however at times I come here to be one with my thoughts, I can be alone here, no one would ever be able to set foot on this sacred land belonging to my family due to it's hidden passage." Rin asks out of curiosity, "What about Inuyasha, does he not know about this place?" Sesshomaru answers, "No, he does not...my father promised this land to my mother and she in turn passed it to me....Inuyasha was not a part of this inheritance. Rin, I want this to be a place you can come to as well when you wish to be alone, use this land for what you will, what is mine will be yours." Rin tells Sesshomaru, "You've given me so much, of all these precious gifts your heart is the one I will cherish most of all." Rin and Sesshomaru kiss and Rin can no longer resist as she asks him, "My Lord Please...No one will come, no one will see." Sesshomaru is hesitant, "Rin, It wouldn't be appropriate here." Rin insists, "There's no shame in it, I will be your wife soon." 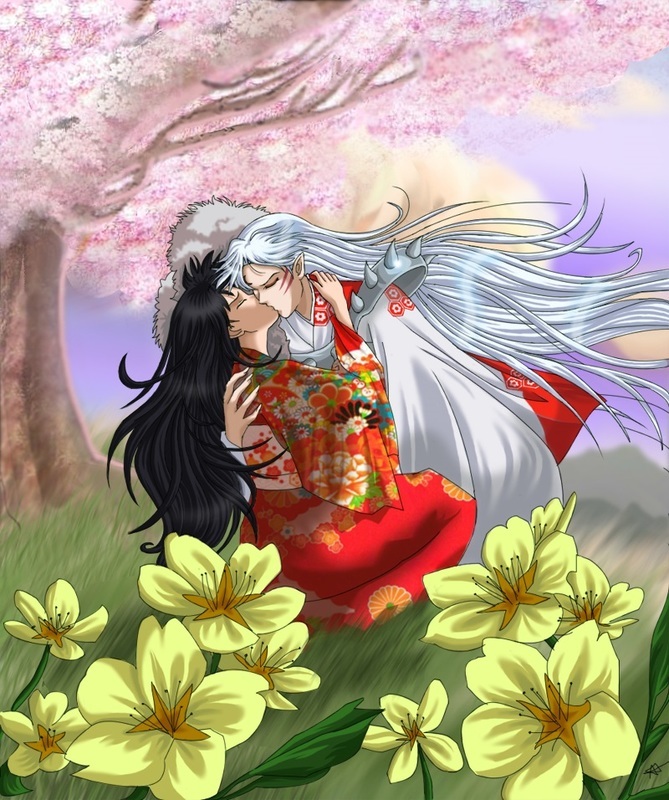 Sesshomaru and Rin resume kissing as he slowly lies her down on the grass. ​The time passes Rin by once again as night falls and Sesshomaru flies her back to the human village at Lady Kaede's Hut. Before he leaves her, Sesshomaru informs Rin that he may not be back to see her for a few days because he has some issues to attend to but he assures her that he will be back to see her and at that time they will both speak to Kaede about their marriage plans. Rin agrees to this, as Sesshomaru heads off, Rin walks into the hut. She tells herself that tomorrow will be the day, she will not hold back and she will tell Kohaku the truth about everything. The next day Rin goes to find Kohaku to speak with him about his proposal of marriage but she has no luck in locating him. Three days pass and still no sign of Kohaku so Rin decides to seek out Sango and ask her if she has seen him. Sango informs Rin that Kohaku has left on a demon slaying job that is a far distance from the village, He was unable to locate Rin at the time so he left out alone. She tells Rin that she doesn't expect Kohaku back for several days however when he returns she will inform Rin immediately. Rin is worried for Kohaku setting out on a demon slaying mission alone and asks Sango what village was it that he went to help. Sango informs Rin of a Village that is about one day flight from here, with that information Rin dons gear fit for slaying demons and flies with Ah Un in search of Kohaku. After a long travel she finally reaches Kohaku who is in the middle of a battle with a fearsome demon, Kohaku sees the demon's blood gush out from it's forehead after being hit with one of the stones from Rin's sling shot. Kohaku is happy to see Rin and he asks her, "Did you come all this way to help me?" Rin responds, "Of course Kohaku, I was so worried about you being here alone. C'mon let's bring this demon down and head home. " They continue to fight the powerful demon and the duo work together to defeat it. After a long stressful battle Rin and Kohaku are successful in freeing the village from the control of yet another demon. Kohaku thanks Rin, "Rin, Thank you for coming to help me...I think I would have had trouble bringing that demon down alone. She was tough." Rin responds, "Don't thank me, we're a team.... but Kohaku let's get back, I'm suddenly not feeling well right now." Kohaku asks Rin, "Are you going to be okay?" Rin Responds unsure, "I think so, I feel faint." At the very moment that she says that she passes out and Kohaku catches her. Back at Zeref's castle The demon that was summoned to help him change Rin's heart is now before him to explain his powers. He bows to Zeref and tell him that his name is Baranuski. He explains to Zeref that he indeed has the power to intensify an emotion that he can sense illuminating from the heart or mind, he can also reverse a feeling of love into hate or hate into love. Baranuski wanting to avoid Zeref's wrath is willing to help him with whatever it is he asks, "Lord Zeref, just tell me where I can find this human girl...What is her name and what does she look like? I will manipulate her heart for you and she will be yours. All I ask Master is that you let me return to the peace and serenity of my home in the Eastern mountains once I have done your bidding." Zeref agrees to the terms and lets Baransuki handle the situation. When Rin wakes up she is back at Lady Kaede's hut and lying down, she starts to get up when Lady Kaede walks in the room and instructs Rin, "Oh No young lady, you must not get out of bed...you are not well." Lady Kaede goes to Rin and adjusts her pillow as she continues speaking, "You fell faint and Kohaku brought you back here, your temperature has been very high also. I had Inuyasha seek out a doctor for you, it will take him some time to get here but you must remain in bed until that time." Rin complies, "Yes ma'am." Rin remains in bed as requested by Lady Kaede, she falls asleep and does not wake again until the morning. As she waits for Inuyasha to return with a doctor. Kagome and Lady Kaede bring Rin food and water and check her temperature to see if it is getting worse but it does not go up or down. Kagome puts her hand to Rin's forehead, "Rin, you're burning up, is it possible you ate something that made you sick?" Rin Responds, "I don't think so, this came on so suddenly." Kagome tells Rin, "Kohaku has been worried about you, wanting to see you but you've been sleeping. We told him to come by later on today." Rin asks Kagome, "Has Lord Sesshomaru come by?" Kagome informs her, "No, not yet. Is he suppose to?" Rin responds, "Yes, he should have been here to visit with me but he's late." Just then Inuyasha walks in with a doctor from another village who agreed to examine Rin and find out what is causing her illness. Inuyasha, Kagome and Lady Kaede all look on in anticipation of Rin's prognosis. He examines her with many hand made instruments that he carried along with him and asking her questions about her activities. "hmm, Demon slaying just the day before you say? Well, that will have to come to an abrupt end, I suspect that type of commotion is too much for a child to deal with." Rin quickly clarifies, "I've been on many demon slayings with Kohaku, this has never happened before and I'm not a child...I'm a young woman." The doctor corrects himself, "Of course you are a young woman. I wasn't referring to you, I meant the child in your belly...you are going to have a baby." The trio standing near by are shocked at what they have just learned but not as shocked as Rin. In her embarrassment and surprise Rin excuses herself telling the group she needs to get some fresh air and be alone for a few minutes to think as she heads out to the lake. Lady Kaede says, "I don't believe it, Rin is with child? I know lots of young men favor her but I didn't know any one was courting her at this time." Kagome asks curiously, "Then who could the father of Rin's baby be? I know she spends a lot of time with Kohaku." Inuyasha chimes in, "No...I'm certain it's safe for me to say that Rin's baby is gonna be born half demon." Kagome shows surprise on her face, "Inuyasha, you think it's Sesshomaru's? How will he feel about having a half human child? his demon empire could crumble over something like that, couldn't it?" Inuyasha responds, "Exactly but if he thinks he's gonna abandon Rin now all for the sake of his stupid empire, he's got another thing coming!!" Lady Kaede provides her wisdom, "Come now Inuyasha, give your brother some credit..he has never abandoned Rin before why would he now?" Inuyasha informs Lady Kaede, "You don't know him like I do, Sesshomaru has sought power and position for years...his empire is too important to him. He won't want it to fall to the ground. I'm gonna find him and have a talk with him." Kagome advises, "Wait, Inuyasha...maybe Rin should be the one to tell him." Inuyasha runs off ignoring Kagome's advice. Inuyasha's runs to find Sesshomaru as he thinks: Rin is too sweet and charming a girl to be ditched... I won't let Sesshomaru do that to her for the sake of being ruler to a bunch of worthless demons. While at the lake Rin has many thoughts going through her head, She will have to give up demon slaying for sure now that she is going to be a mother. How will Lord Sesshomaru feel about this? How will she tell Kohaku? Her thoughts are interrupted by what appears to be an old woman that comes near to sit with her but it is the demon Baranuski in disguise. The old woman sits with Rin and asks her "My child, It's none of my business but I can feel you hold many emotions in your heart and many thoughts on your mind. Please let me lend a shoulder, what troubles you so? " Rin does not know what strangers to trust and what strangers not to trust so she tells the old woman very little, only informing that things are happening in her life faster than she can handle it and though she is happy she feels she is not ready for such big changes in so little time. The demon disguised as the old woman continues to talk to Rin but is unable to get much information out of her, the demon uses his powerful ability to search for feelings of hate or any emotion related to hate within Rin's heart but he can find only hate in her heart for one person, Lord Zeref. Baranuski can also sense her feelings of joy and excitement about being a new mother so he now also knows she is carrying the child of the man she loves. Baranuski ends the conversation with Rin and heads back to Zeref with this information. He tells Zeref, there is a problem. In order to accomplish mind and heart manipulation, an emotion that symbolizes the main one must exist, even in it's smallest form. Meaning that in order for him to intensify love in Rin's heart for Zeref she would have to possess some form of caring, affection or even feelings of like for him but she does not. In order for him to intensify hate in her heart for Sesshomaru she would have to feel some form of bitterness, betrayal or anger towards him but she does not. In addition, the child that is forming in Rin's belly binds she and Sesshomaru as one, Baranunski does not have the ability to break the bond. Zeref is enraged when he hears that another plan has failed and he tells Baranuski that he may not leave back to the Eastern Mountains because he still has plans to use this power. Zeref thinks: If I can't have her as my mistress then I will kill her and bring the Mighty Sesshomaru to his knees, defeating him while he is in a vulnerable state from losing his woman.